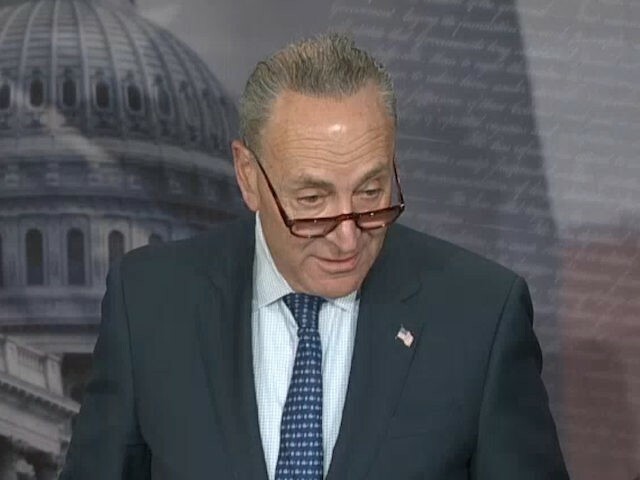 Democratic leader Sen. Chuck Schumer immediately rejected a last-minute offer by Majority Leader Mitch McConnell, who said Sunday evening that he could schedule an amnesty debate if the Democrats stopped their filibuster of 2018 government funding bill. Schumer’s immediate rejection, however, does not kill McConnell’s proposal, which will be voted on midday on Monday, the first business day of the Democrat-enforced government shutdown. The proposal, if passed, would allow a three-week stopgap 2018 budget lasting until February 8. Schumer can personally vote against the McConnell proposal while quietly encouraging its passage. If Schumer lets roughly seven Democratic Senators switch sides, then McConnell’s three-week budget stopgap plan would go to the House for approval. Here is the math on tomorrow’s procedural vote. Sources expecting Graham/Flake to flip to yes. They were noes Friday. But with McCain out, they still need 12 Dem yeas to hit 60. They got 5 Friday. Can they get 7 more? Multiple sources have said they get into high 50s. Who is 60? Amnesty enthusiast GOP Sen. Jeff Flake said he welcomed the McConnell concession and would vote for McConnell’s proposal for a short-term budget up to February 8, because it would allow an amnesty debate. “I will add my vote for this agreement,” he said shortly after McConnell spoke on the Senate floor. The McConnell concession is similar to the proposal by a group of roughly 20 Senators, which includes liberal Republicans and several Democrats facing red-state voters in November. The group is informally led GOP Sen. Susan Collins, from Maine. She is a supporter of the “Gang of Six” amnesty for several million young illegals and their parents. When the Democrat filibuster of the government funding bill ends, the serious, bipartisan negotiations that have been going on for months now to resolve our unfinished business—military spending; disaster relief; healthcare; immigration and border security—will continue. It would be my intention to resolve these issues as quickly as possible so that we can move on to other business that is important to our country. However should these issues not be resolved by the time the funding bill before us expires on February 8, 2018, assuming that the government remains open, it would be my intention to proceed to legislation that would address DACA, border security, and related issues. It is also my intention to take up legislation regarding increased defense funding, disaster relief, and other important matters. McConnell’s concession may be too weak or too vague for Schumer and many red-state Democratic Senators. Also, McConnell did not set a date for the post-filibuster immigration debate and also suggested that it would be based on negotiations by the second-ranking legislators in the House and Senate. “There is a bipartisan, bicameral group that will continue its negotiations and I look forward to the completion of their work,” McConnell said. Democrats believe that the two GO Pleaders on that panel — Sen. John Cornyn and Majority Leader Rep. Kevin McCarthy — may never agree to their huge amnesty plans. Also, many red-state Democratic Senators are reluctant to openly vote for a Democratic amnesty plan that will not become law. For example, the House could simply ignore the Senate’s approval of an amnesty bill, just as the House ignored the Senators’ 2013 vote for the “Gang of Eight” amnesty. That one-step process would leave them with unpopular pro-amnesty votes on their record before the November election — but no political benefits to show their disappointed supporters. In 2014, after they voted for the Gang of Eight amnesty, five incumbent Democrats lost their seats, allowing the GOP to pick up nine seats and regain the majority. Also, McConnell’s offer might be just a repetition of prior offers for amnesty debates. Pro-American immigration expert Sen. Tom Cotton tweeted Sunday morning that McConnell had earlier agreed to allow Senators to have a debate on immigration. Just so you know: @SenateMajLdr willing to bring an immigration bill to floor in Feb … & has been for 4 months! Not enough for #SchumerShutdown Dems: they want guaranteed passage of amnesty without real security & reform.